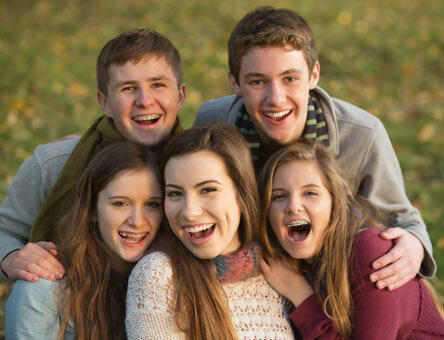 Between the ages of 11 and 15 is the most common time for orthodontic treatment – and for good reason. By age 12, most, if not all, permanent teeth have erupted and are in place and crooked teeth, gaps and bad bites can be easily detected. These problems will hardly ever correct themselves, so this is when most parents decide to seek orthodontic treatment. This is also a good time for orthodontic treatment because negative association with braces is not present. Many children in this age range undergo orthodontic treatment and are able to be convinced to wear braces because they see their friends wearing them and they want to fit in. Braces today come in a variety of styles and materials, making life with braces much easier, more comfortable and even more stylish than in the past. Some are even invisible – ask us about Invisalign ®, Invisalign Teen ™, Incognito ™ or clear braces. Early treatment– Early treatment allows monitorization of growth of the jaw and recommendations for further orthodontic treatment if it becomes necessary. Not everybody receives early orthodontic treatment, and in some cases, it may be recommended that a patient wait until they are older to receive treatment. What needs correction– The amount of treatment needed in order to correct a problem will determine how long the process takes,. Different patients react to treatment differently; so, while it may take one patient only 12 months to complete their treatment, it may take another patient 24 months. Treatment times can vary depending on how quickly your body responds and how much work is needed to give you the smile you expect. You!– Your willingness to use the appliances Dr Rodriguez gives you, plays a major role in the length of time it takes to complete your treatment. Always remember to take care of your braces and appliances; this truly will help making your treatment shorter. At Braces 4U, we use the most innovative, braces available to suit your needs. The most common ones are available in either clear or metal and are very small and smooth, very cool and discreet. Now is a great time to be wearing braces; so don’t be shy, go wild and personalize your braces to fit your personality and lifestyle. Eating with braces is another hot topic for many teens your age! You’ve probably heard from your parents and friends the long list of foods and drinks that you should avoid consuming while wearing braces. Don’t let this worry you; before long you will be able to eat all the food that you enjoy, but until then you need to make few changes to your diet. Braces are a big part of life of many young people like you. Wearing braces makes it easy to look good and feel good while giving you the perfect smile! Please contact us on 4840 2832 with any questions you may have or to schedule your next appointment.